IP MAN 3 has accumulated HK$ 55 million as of yesterday. In the film Bruce Lee's challenge to Ip Man is very memorable. 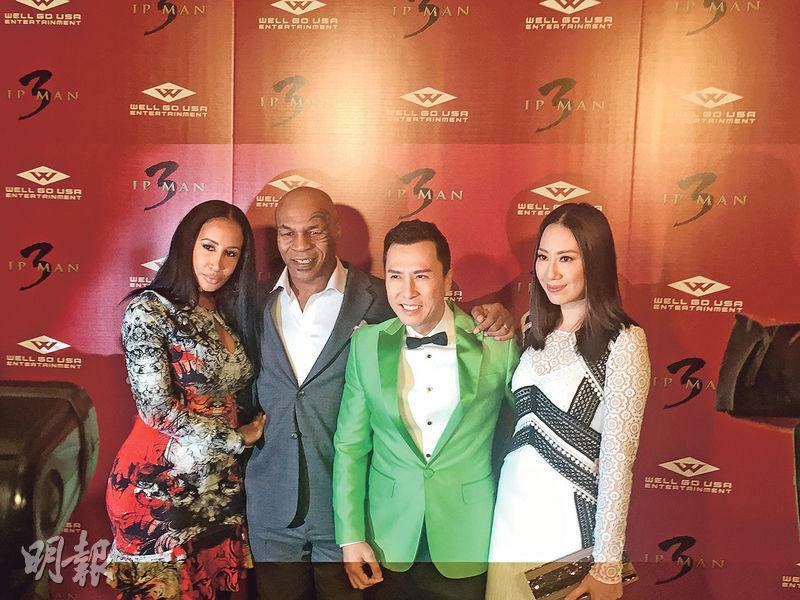 IP MAN 3 held its Los Angeles premiere. Donnie Yen Chi Tan attended with his wife Cissy Wang. Chi Tan has not appeared in the U.S. for awhile and attracted many fans. Many asked for autographs with the film poster and boxing gloves. Former world heavyweight champion Mike Tyson, U.S. rap artist Snoop Dogg and Chi Tan's sister Chris Yen Chi Ching also appeared. The premiere was sold out. Chi Tan said that many friends wanted to attend the premiere but even he could not get a ticket. With the passion of the American fans and the film's Asian box office success, Chi Tan excitedly said, "I am confident that it can break Hong Kong box office records to become te highest grossing Hong Kong film." After the premiere many tough guys left with tears in their eyes. Chi Tan said, "I never expect foreigners to get into it completely. I am very touched. The film is popular in Europe and America, positive energy is enough to affect the people there." Chi Tan hoped that viewers would cherish those around them like Ip Man did. He said that whenever he had time he would spend it with his family. On this American promotion he also brought his wife so they could spend more time together. As of yesterday, IP MAN 3's Hong Kong box office accumulated HK$ 55 million and have hope to break 60 million. Chi Tan at the premiere told Tyson about the Hong Kong, Taiwan and Malaysia record breaking box office. Tyson said at the premiere, "We beat STAR WARS in Asia!" He even said, "If you can't beat them, join them" as he joked that STAR WARS in order to beat IP MAN 3 recruited Chi Tan. Chi Tan will promote in the U.S. for a few days. Tyson would also like to take him to dinner. IP MAN 3 will open in the Mainland on March 4th. Chi Tan will promote in the Mainland in late February. He also invited Tyson to promote in the Mainland together. He even joked that he will treat him to Peking Duck in Beijing, as he hoped to lure Tyson to promote with him. Chi Tan and Tyson spoke to a lot of media in Los Angeles and did a live interview on facebook. Some asked Tyson if his fight with Chi Tan a huge challenge. 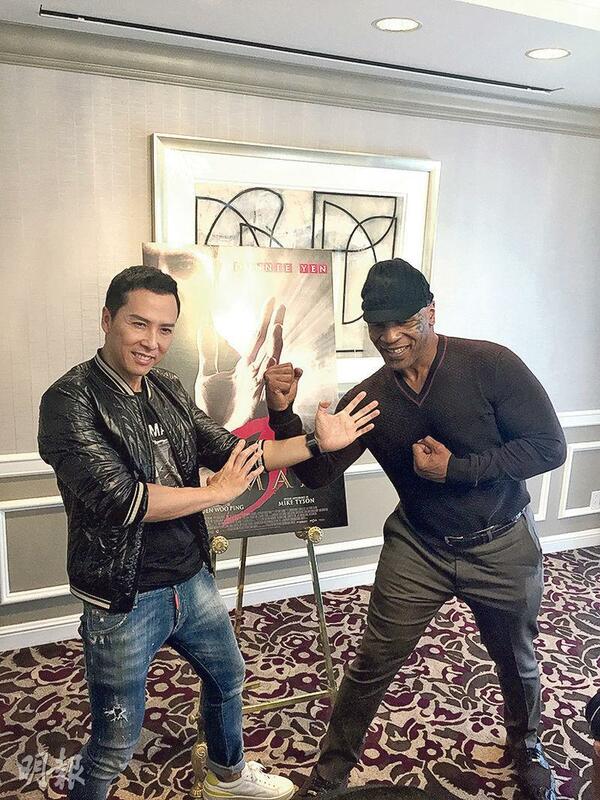 Tyson said, "I really like to make action film, my performance this time is also the best." Chi Tan was asked if he will make IP MAN 4. He said, "As long as the audience and fans like the IP MAN film series, I can't think of any reason not to keep going. However it still will depend on various coordination like the director, the film company and the story before I can confirm."